Extreme ironing has taken place on Mount Snowdon, as has playing the piano, but no caravan has, as yet, been 'found' at the summit. Caravan holidays in Wales have been popular for years and to appreciate the tallest mountain in Wales when on tour, you really need to find one of the many campsites that adorn Snowdonia National Park – there are one or two literally at the foot of Mount Snowdon. While Mount Snowdon, at 3560 feet (1085m) may be the focal point of Snowdonia, the national park in North Wales has a lot more to offer with a diverse landscape of glacial valleys, steep gorges, forests, lakes and sandy beaches. Nine conjoined mountain ranges cover almost 52% of the Snowdonia National Park, which itself covers a total of 823 square miles. Its natural beauty and rugged terrain attracts adventure seekers and sports enthusiasts in their droves, whether to climb a mountain, hurtle down a mountainside on two wheels or navigate along a fast-moving river in a kayak. Walking here, however, doesn't have to automatically mean an ascent of Snowdon. It can include a leisurely stroll along the coastline – pick the 15-mile stretch of beautiful golden beach from Barmouth to Harlech Point, for example, on the west coast of Wales overlooking Cardigan Bay. There are accessible walks for wheelchairs and pushchairs too, such as the Mawddach Trail, utilising an old railway line between Dolgellau and Morfa Mawddach, or the Janus Path near Lake Cwellyn. One of the best places to enjoy mountain scenery in North Wales without the need for strenuous uphill climbs is a walk in the glacial Nant Ffrancon, with facilities at the new Ogwen Warden Centre. Walking here offers the rugged beauty of the Carneddau and Glyderau mountain ranges without actually having to climb them. When taking family caravan holidays in North Wales, go cycling on the Mawddach Trail for gentle traffic-free bicycle rides. Snowdonia also offers some of the best mountain biking terrain in the UK. All three forest parks in the area – Coed y Brenin (in southern Snowdonia), Beddgelert (closest to Snowdon) and Gwydyr (near Betws-y-Coed) – offer a selection of mountain biking and family cycling trails, from easy routes through to moderate and the very extreme. Of course, if the idea of watersports in Wales is more appealing, Snowdonia is also home to fantastic lakes and lively rivers. Lake Bala (also known as Llyn Tegid) is renowned for its watersports, while Lake Celyn is home to the National White Water Centre and Lake Trawsfynydd, a man-made reservoir, is used, along with its surroundings, as an outdoor adventure site and is popular with anglers. Some of the UK's finest white water kayaking can be found on the Afon (River) Ogwen in Nant Ffrancon, although you'll find a slightly milder course for rafting at Betws-y-Coed. Go climbing in Snowdonia, because it is naturally, a major component of adventure activities in the mountains of North Wales – and, for many, a major part of caravan holidays in Snowdonia. For those who find the prospect of climbing Mount Snowdon too great, it's a little easier to walk up Cader Idris, a mere baby by comparison at 2,926 feet (892m), in the southern part of the national park. If you're looking for outdoor climbing courses at all levels, take some climbing tuition at Plas y Brenin, the National Mountain Sports Centre at Capel Curig, to gain some experience prior to setting out. However, for family days out involving carefree climbing and swinging through the trees, there's no better place to head than Go Ape! at Coed y Brenin Forest Park or Tree Top Adventure at Betws-y-Coed. In addition to high ropes, bridges and zip wires here, there's a Junior Tree Trail, designed for children aged four to eight years. Of course, for the ultimate in zip wires, it has to be Zip World at Bethesda, the longest and fastest in Europe – and don't forget the brand new Zip World Titan, an entire zip zone with over eight kilometres of zip lines at the famous Llechwedd Slate Caverns in Blaenau Ffestiniog. The caverns themselves are a lasting legacy of a major Welsh industry that's worth investigating to see the remnants of a Victorian slate mine (although slate mining continues to this day in the area). 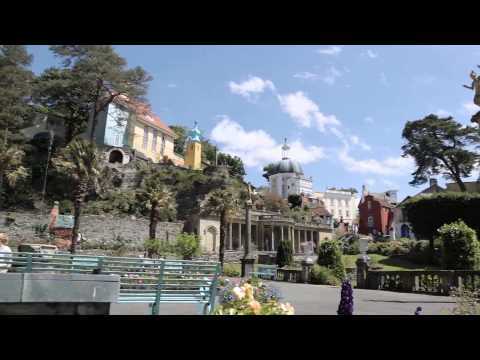 The town of Blaenau Ffestiniog is also at the start of the Ffestiniog & Welsh Highland Railway, which steams its way to the coastal town of Porthmadog. The steam railway is one of seven narrow gauge railways in Snowdonia. Six of them were originally created to carry slate from the mines to the ports for export around the world. Now they offer some of the most scenic railway journeys in Britain. The shortest, at just 1¾ miles long, is the Fairbourne Steam Railway, on the coast between Fairbourne and Penrhyn Point. It provides a stunning coastal, indeed, beachside ride with views of the Mawddach estuary. Other picturesque routes include the Llanberis Lake Railway and Bala Lake Railway, both offering pretty lakeside vistas, the Welsh Highland Railway from Porthmadog to Caernarfon and the Tal-y-Llyn Railway from Abergynolwy to Tywyn in southern Snowdonia. But the king of them all is the Snowdon Mountain Railway. A deliberate tourist train (rather than transporting slate), the rack and pinion railway was created at the height of Victorian Britain and the European Grand Tour, when wealthy tourists wished to conquer all the sights. It continues to provide tourists today with the opportunity to 'conquer' Mount Snowdon. Llanberis, at the foot of Snowdon, is the busy little town from which to catch the train. It is a dedicated tourist town, as is Betws-y-Coed, an attractive gateway east of the Snowdonia National Park, filled with outdoor clothing shops, and as many eateries. Visit Dolgellau, at the foothills of Cader Idris and on the banks of the River Wnion, too, it's a pretty market town with over 200 listed buildings. It made its name in the 19th century with the discovery of gold there – the Clogau St David's gold mine at nearby Bontddu offered rare Welsh gold until its closure in 1998. Gold from the mine has been used to make royal wedding rings since 1911. Aberdyfi, Harlech and Barmouth are all coastal towns within the Snowdonia National Park. Harlech Castle, once right on the coast, now sits back 'inland' with the waters of Tremadog Bay receding over time, the impressive fortress pinned to a rock erupting from the town. To see the prettiest settlement in Snowdonia visit Beddgelert, a tiny village seven miles north east of Porthmadog and to the south west of Snowdon. It's a great base from which to start 'that' all-conquering climb on foot. Whether you're going up the mountain or not, enjoy the picturesque charm of the village and devour afternoon tea in Beddgelert, even if you do it post-climb, while nursing sore feet! Whether on foot or by the mountain railway, climbing Mount Snowdon is one of Snowdonia's absolute must-do activities on your caravan holidays in North Wales. Take the Snowdon Mountain Railway train one way and walk the other along one of the well-trodden routes to the summit. The views from the top are out of this world. Take an adrenalin-fuelled ride on the longest and fastest zip wire in Europe when staying at one of the campsites in Snowdonia. 'Flying' over the Penrhyn Quarry, you'll reach speeds of 100mph, 500 feet above the ground. Head deep into the Elidir Mountain from the Electric Mountain centre in Llanberis to visit the Dinorwig hydroelectric power station. On the underground tour you'll witness the power station's massive pump and turbines in action and see how electricity is generated using the power of water. Discover the underground world of stalactites and stalagmites in the colourful chambers when you visit the Sygun Copper Mine, where copper was mined commercially from the Industrial Revolution until the end of the Victorian era. Once back on the earth's surface, try panning for gold, too. On your caravan holidays in North Wales, you can visit Conwy Castle or Harlech Castle, both 13th century coastal fortifications built by Edward I. Alternatively, in the heart of Snowdonia National Park are the romantic ruins of Dolwyddelan Castle, a solitary fortress that stands atop a craggy hill. Planning caravan holidays in Wales? If you're staying at one of the campsites in Snowdonia National Park, there's lots to do whenever you visit. Snowdonia is dominated by sporting events throughout the year with numerous running, cycling and triathlon-based programmes of varying degrees of difficulty from fun runs to the Snowdonia Slateman (equivalent to an Ironman triathlon) in May and the Snowdonia Marathon in October. If that all sounds too energetic, the pace can be slowed with the annual Bala Challenge Charity Walk around Llyn Tegid (Lake Bala) in May, or a choice of the Barmouth Walking Festival in September or the Snowdonia Walking Festival in October. Away from physical activity, on your caravan holidays in Wales you could enjoy the Rail Ale Festival every May in Caernarfon, the Snowdonia Arts Festival based in Betws-y-Coed in June and the colourful Barmouth Kite Festival in July. Located close to the far north west corner of Wales, getting to campsites in Snowdonia for your caravan holidays in North Wales is never going to be the quickest journey. The fastest flowing route is the A55 dual carriageway from Chester, which runs right along the north coast of Wales. When time allows, an alternative is to include the journey to Snowdonia as a part of your caravan holiday and take one of the slower but more scenic A-roads. The A470 from Newtown approaches Snowdonia from the south and divides the area in two, running north to Conwy. The A487 from Aberystwyth and the A458 from Welshpool also serve southern Snowdonia. The other main route is the A5 from Shrewsbury, passing through delightful Llangollen to Betws-y-Coed and beyond to Bangor, and this is arguably one of the prettiest main roads in Britain.